Dyson V6 Slim Cordless Vacuum in Action! I’ve always wanted a cordless vacuum and once I heard that the Dyson V6 Slim was a cordless and powerful, it was time to give one a try! 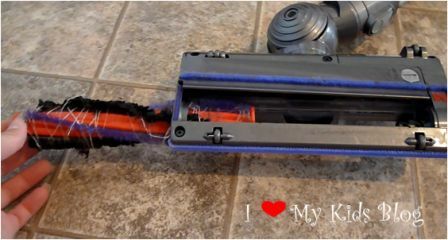 I’m so glad I did because I am in love with this vacuum! Before you say my sister’s favorite catchphrase from our childhood, “then why don’t you marry it” let me tell you why I’m so smitten with this cordless vacuum! First of all it’s a Dyson, so you KNOW by reputation that it is well built! 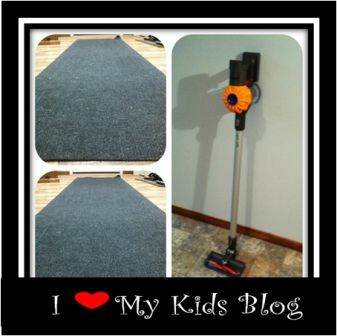 Second, it is so easy, lightweight, powerful, and versatile (I’ve used it on tile, laminate, rugs, carpet, in my minivan, even used it to vacuum up drywall dust off the concrete floor in the basement-it is VERY versatile!!) 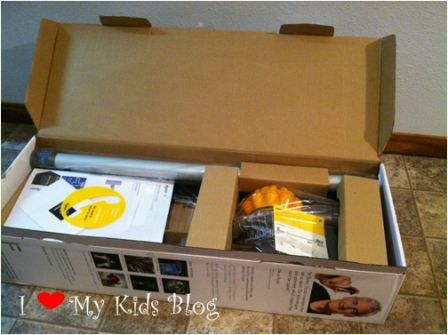 The Dyson V6 Slim cordless vacuum was shipped right to my door and once I opened the box I knew there would be some assembly required. There was an easy to follow instruction guide right on top! At first, I did wish the charger docking station came with the hardware to attach it to the wall, but I suppose that every wall may be a bit different and it would be hard to make sure the proper hardware was used in all cases if they sent it out, I guessed that is why it didn’t come with the package and quickly got over it. The vacuum itself took less than 10 seconds to assemble. 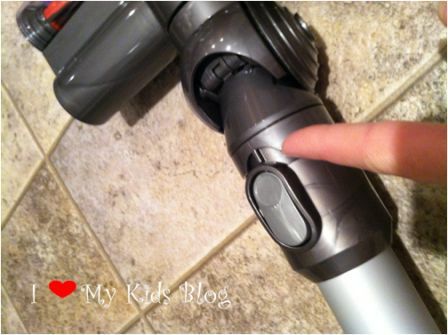 Dyson uses this awesome click to connect system that just makes it as easy as pressing a button! All you do is slide it into place and it clicks to connect. If you want to remove the larger cleaning head, you can just press that button and it simply disconnects. One feature I LOVE about this cordless vacuum is it can go anywhere and be used several different ways. 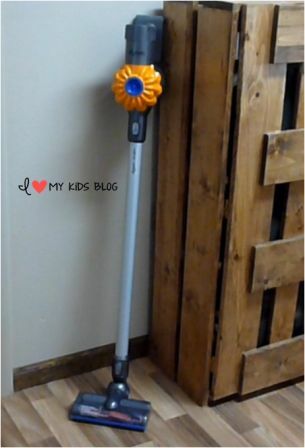 It can be used as a tall vacuum by using the large cleaning head, the long pole, and the powerful filter base. I think the vacuum weighs maybe 7-8 lbs, so I can even ask my 4 year old to go get the vacuum for me if I’m trying to keep my 1 year old out of the giant pile of dry rice she just spilled all over the floor. Or I can take my baby with me and carry both her and the vacuum! The cleaning heads attach easily and can swivel both forwards/backwards and sideways making those hard to reach spots not so hard to reach! Perhaps my favorite feature that the Dyson V6 Slim cordless vacuum boasts is it’s ability to go from hard floors to soft floors without even having to touch a button. I can go from the rug, to the wood flooring in the entry way, to the tile in the kitchen to the carpet in the living room, to the bathroom floor laminate without having to stop! It is incredibly powerful and can last up to 20 minutes of vacuuming on it’s regular setting without needing to be charged! In the picture below you can see the top picture the rug is quite dirty, the bottom picture it looks amazing! It also has a MAX option which increases suction. I live out in the country (we moved here last week) and we have dirt roads all around us. I’m finding out that dust is a big challenge! I was shocked at how much dust the Dyson V6 Slim picked up off my rug because it had been vacuumed the day before with my old vacuum. I couldn’t believe there was this much on the rug in 24 hours! Emptying the filter is so easy to do, just press down the red lever and the bottom of the filter canister pops open to empty it. You are required to press the red power button and hold it while you vacuum, which is a bit different than any other vacuum I’ve used, but it doesn’t bother me to do so. We have a whole bunch of girls at my house-5 of us, so unintentionally, we tend to vacuum up a lot rubber hairbands, hair strands, and crafting string. With my old vacuum I’d have to flip it over and pull, pull, pull to get all those annoying strands off the roller part of the vacuum. With the V6 slim I can just use a coin to remove the side compartment and the carbon fiber filaments (the twisting thing) pull right out making it so easy to clean! 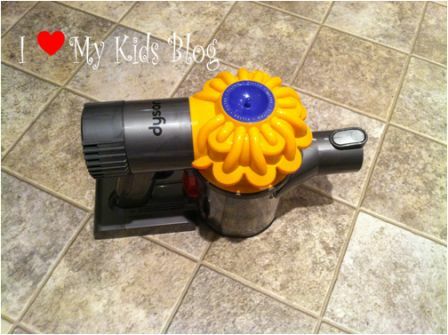 This vacuum is smooth, easy to use, so lightweight, and this even shocked me, it’s FUN to use! I love to see the difference in my floor before and after! This prototype vacuum went through tons of impressive testing. On/off buttons were punched 20,000 times, they are dropped 10,000 times, they go through 636 different validation tests, and the cleaner heads were slammed into iron table legs. 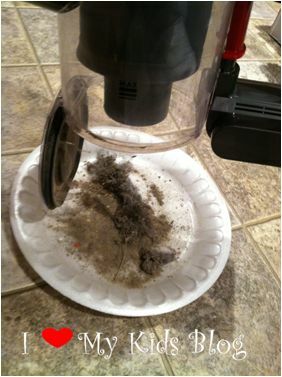 This vacuum is built to last! Honestly, I have never had so many willing vacuum volunteers! The best part is they can manage it so well because it is so lightweight and there are no cords to hold them up or get wrapped around the baby! 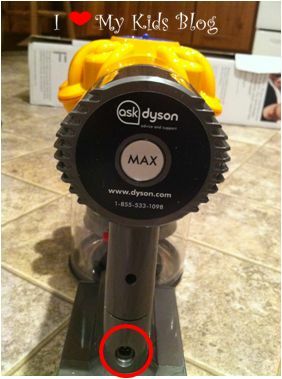 Dyson also recommends that once a month you remove your filter and wash it! I love that I can do this! Talking about the vacuum doesn’t do it justice, so I made a video going over some of it’s highlights and showing it in action! The Dyson V6 Slim Cordless Vacuum can be purchased at Walmart for $289.00, you even get free shipping on this cordless vacuum! To sum up my honest feelings. I think this vacuum is amazing! It is fun to use, easy to use, lightweight, can function well on hard and soft floors without adjusting settings, it’s versatile and can be used in many different ways to accomplish any task. It really only took about 10 seconds for me to fall in love with it! 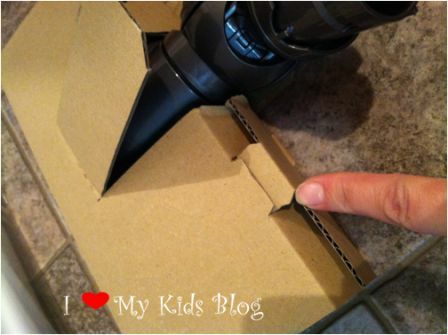 I find that I am vacuuming every day because it is so easy! 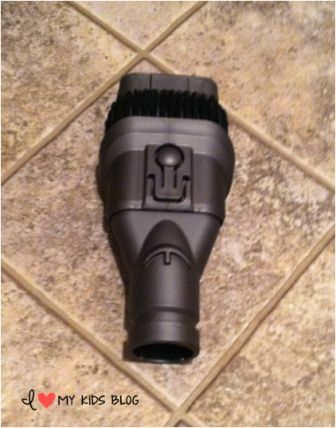 Do you think you’d like to try out this vacuum? What is your favorite feature? Tell me in the comments below! 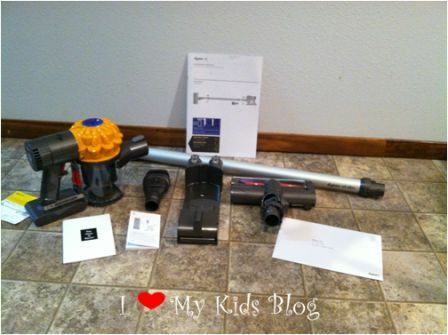 Disclosure: I received the product mentioned above so I could gain an opinion to share with you, Regardless of this arrangement I was not required to give a positive blogger review of this Dyson V6 cordless vacuum. All opinions mentioned above are my own. I really do love this vacuum! picks up lots of dirt but battery life is way too short. Dyson has to fix this problem solve. Are you agree about this in you experience or What’s your opinion about that? I was worried about that too, but in the years that I have had this, I’ve never run out of battery before I had my entire house vacuumed. It hasn’t been a problem for me so far.